Steven Lubar writes, in “Seven Rules for Public Humanists”: “The work of public engagement comes not after the scholarship, but as part of the scholarship.” This symposium will explore the very public shapes that digital scholarship takes, thinking through and past the idea that “going public” is about more than mere dissemination or promotion of research. Instead, we will explore the ways that the digital humanities asks us to rethink how communities form and engage around public work in research, teaching, and art. We will also think about how the form of the work can change the nature of the work. Our hope is to gather together researchers from across disciplines to consider the ways digital scholars and students can work openly in public spaces—and the ways educational institutions can support that work. The symposium will also feature poster sessions, panels, and interactive workshops, including one by HathiTrust Research Center. We encourage submissions by faculty, staff, instructors, librarians, research groups, undergraduate and graduate students, postdoctoral fellows, and independent scholars. A poster to be displayed in your absence. In addition, if proposing a poster, please note whether your poster would best be displayed in digital or physical form. The live poster/demo session will take place at 10:30 a.m., but we encourage participants to leave their posters up all day to allow more viewing time. 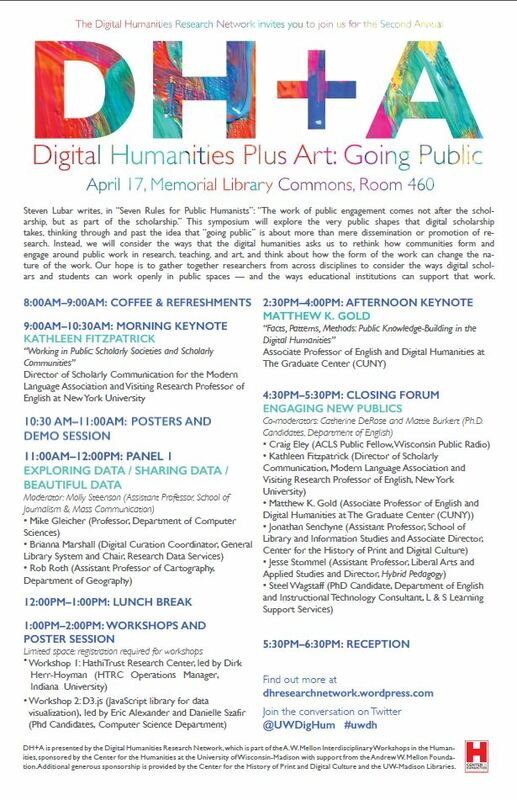 The Digital Humanities Research Network will be offering two workshops from 1:00-2:00pm on Friday, April 17 at Memorial Library as part of the Annual DH+Art Symposium. Participants are encouraged to bring their own project ideas to the workshops. Registration is open to undergraduate and graduate students, postdoctoral fellows, faculty, staff, instructors, librarians, research groups, and independent scholars. This workshop will introduce participants to the research tools that are available for analyzing works in the HathiTrust Digital Library collection. It will include a walk-through of getting setup with the HathiTrust Research Center tools, along with a simple example of text data mining analytics. Participants will have the opportunity to share their own potential research project needs, and Dirk will give advice on how to get started. No prior DH experience is required. Registration is required and will be capped at 15 participants for each workshop. To register for the HathiTrust workshop, please visit http://goo.gl/forms/6wBNLplgu0. To register for the D3.js workshop, please visit http://goo.gl/forms/sJ2Qu7PJ94. For additional information, please contact Danielle Albers at <dalbers@cs.wisc.edu>. DH+A is presented by the Digital Humanities Research Network, which is part of the A. W. Mellon Interdisciplinary Workshops in the Humanities, sponsored by the Center for the Humanities at the University of Wisconsin-Madison with support from the Andrew W. Mellon Foundation. Additional generous sponsorship is provided by the Center for the History of Print and Digital Culture and the UW-Madison Libraries.